Sydney locals will soon have a new way to cool down in the summer months, with construction work beginning on the newest Wet’n’Wild water park located in Prospect, New South Wales. Acclaimed Australasian design firm The Buchan Group were appointed by Village Roadshow in March 2012 to manage the master-planning, architecture, interior design, graphics and signage components for the project. Construction has started on the $115 million project, with initial clearing works already underway on the 25ha site. The project is programmed for completion in December 2013 in time for all to enjoy the water park during the summer heat. The Buchan Group Sydney Principal Nathan Hones said that the project offered a set of unique challenges for the design team. “The finished water park is expected to host up to 15,000 guests per day in the peak periods, so durability, maintenance and safety were key design elements,” Mr Hones said. “The finished product must cater for a range of demographics, from toddlers all the way to grandparents, and the team took this into consideration during the master-planning process. “The design for Wet’n’Wild Sydney incorporates cutting edge technology in areas such as ticketing, food and beverage delivery, and marketing channels including online ticketing platforms and social media integration. Village Roadshow General Manager Chris Warhurst said that upon completion Wet’n’Wild Sydney is set to be one of the top ten water parks in the world. 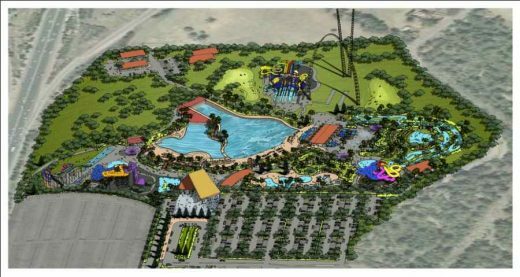 “Wet’n’Wild Sydney will be the fourth water park delivered by Village Roadshow, joining the existing park on the Gold Coast, and those in Phoenix and Hawaii in the United States,” Mr Warhurst said. “Upon completion Wet’n’Wild Sydney will feature 42 rides and attractions, some of the highlights include one of the world’s largest man-made beaches and Australia’s first ‘surfable’ wave pool.